CHAMPIONSHIP UNDERWAY – Skip George Hilderman, background, watches as skip Tyler Williams calls his next shot this morning during the opening draw of the territorial men’s curling championship. 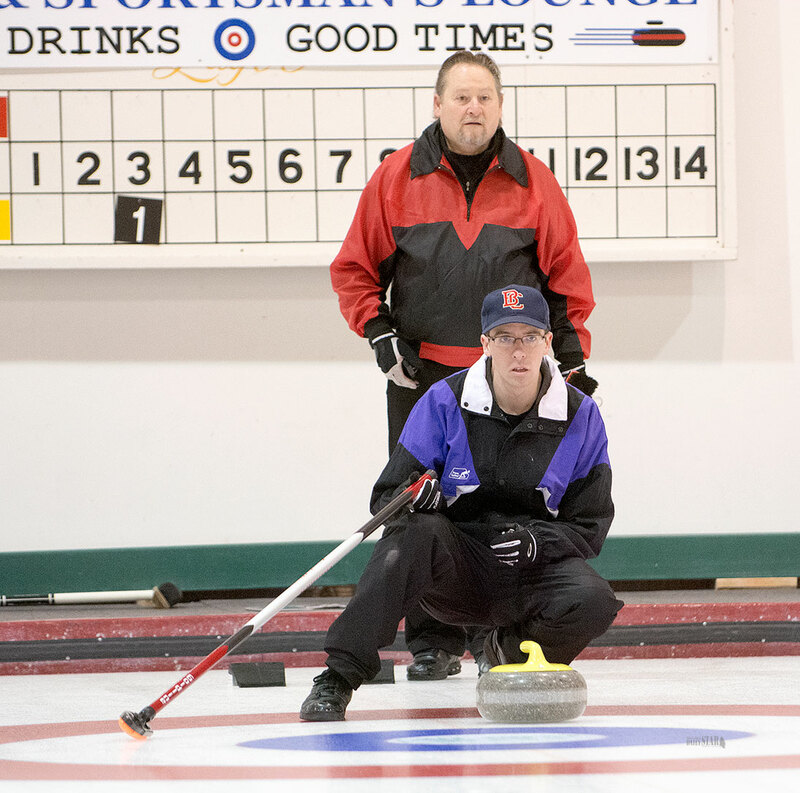 Competition for the territorial men’s curling championship is tougher than it has been for years. Six rinks kicked off the weekend playoff this morning. For the first time, the winner will go straight to a pre-qualification round at the Tim Horton’s Brier, instead of having to battle with the Northwest Territories and the unflappable Jamie Koe rink for a seat at the national championship. Laura Eby, executive director of the Yukon Curling Association, attributes this year’s growing interest in the territorial playdowns to two things. There is the re-structuring of the Brier event, but she believes the move by the association to promote greater competitiveness locally has also been a factor. Eby said the curling association over the past two years has sponsored five clinics led by national curling guru Bill Tshirhart of British Columbia. Tshirhart, she said, will be with the Sarah Koltun rink when they represent the Yukon at the Scotties Tournament of Hearts next month in Moose Jaw, Sask. “The Yukon Curling Association has been very active in promoting competition,” Eby said in an interview Thursday. She said the winner of the territorial playdowns will go directly to Calgary for the Brier’s pre-qualification round. And if the Yukon makes it through to the main event and happens to do well, the territory will automatically get a berth in the main event next year, she explained. Skipping the six rinks this weekend are: Tyler Williams, Robert Smallwood, Ray Mikkelsen, Pat Paslawski, Walter Wallingham and George Hilderman. In draw number one as of noon today, the Hilderman rink defeated Williams 14-1 in six ends, Paslawski was leading Mikkelsen 5-4 after seven of 10 ends, and Smallwood was leading Wallingham 4-3 after six. Eby said the championship is based on a full round robin with the final draw scheduled for Sunday morning. Should there be a tie in the standings, a playoff has been slotted for Sunday afternoon, she said. Chad Cowan of Whitehorse was the last skip to represent the Yukon at the Brier back in 2008. Since then, and two years prior, it’s been all Jamie Koe from the Yellowknife curling club representing the two territories. Danny Lamoureux of the Canadian Curling Association explained this morning the first pre-qualification event will see the Yukon champion playing off against Prince Edward Island and Nova Scotia. Nunavut would have been included but it declined to participate in this year’s Brier event, he said. Lamoureux said the pre-qualification round was determined by the win-loss record of each territory and province over the previous three Briers. Koe, as a result, was given a berth in the main event this year, he explained. The Yellowknife skip finished last year’s Bier with three wins and eight losses. The format for the Scotties has been changed to include a pre-qualification round, and the Koltun rink will face the Northwest Territories and Northern Ontario to see who moves on to the main event.